CHARLES Taylor today (Thursday) became the first former head of state convicted by an international court since the Nuremburg military tribunal of Nazis after World War II – and it was an Irish general who got him there. Taylor, Liberia’s ex-president, was found guilty on Thursday morning of “aiding and abetting” mass-murder and other atrocities in neighbouring Sierra Leone, and for planning some of the crimes – although the court found he did not bear primary responsibility for them. He is expected to be sentenced on May 30. But he may never have faced justice if it were not for the work of the predominantly Irish UN forces – and one man in particular. Paul Pakenham, 61, and from Knocklyon, Dublin, was handed the task of apprehending Taylor for the UN, and getting him to the court in The Hague. These military operations, called Kilbride and Lansdowne, were led by him and carried out in large part by Irish soldiers. Brig Gen Pakenham (now retired) was face-to-face with Taylor while escorting him out of Africa. Speaking after the verdict was handed down in the Special Court for Sierra Leone in The Hague, he said: “This is a huge red-letter day for international law, for respect for human rights, and for justice, truth and reconciliation. And it was a particular source of pride that it was largely young Irish soldiers who helped make it happen. He said: “If you were of my age, you’d remember the atrocities in the Congo where we lost soldiers in ambushes, and the bodies never came home. Some may remember atrocities in Northern Ireland. One of the judges involved in the Taylor case, Justice Teresa Doherty, is from Portstewart. But Justice Doherty, who also serves as a Parole Commissioner for Northern Ireland, declined to be interviewed. The judgement was read out for around two hours to a hushed courtroom by presiding judge Richard Lussick. Among the outrages which the court listened to were accounts of the letters ‘RUF’ being carved into the faces of children, and the disembowelling of a man whose entrails were spread across the road to form a rebel checkpoint. The court found that while Taylor helped and influenced the RUF (Revolutionary United Front) rebels, he did not exercise “command and control” over their actions. It is possible for Taylor to appeal the court’s decision. If jailed, as expected, he will serve his prison sentence in the UK. The trial began when an international warrant for Taylor’s arrest was issued in 2003. By 2006, he was living in Nigeria, but it was agreed that he should be captured and put on trial. 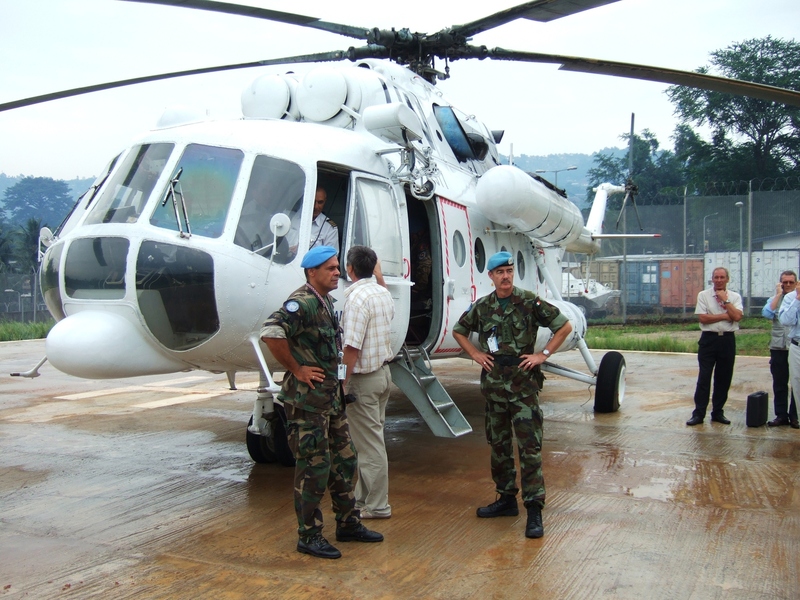 The responsibility fell to Brig Gen Pakenham, as chief operations officer with UNMIL, the UN mission in Liberia. There were around 300 Irish peacekeepers in Liberia, based in Camp Clara, the site of an old hotel in the capital Monrovia. The first phase of getting Taylor before a court was called Operation Kilbride. Nigerian forces captured him while he was on the run, and he was flown to Monrovia on March 29, 2006. Around 100 Irish peacekeeping forces built a military cordon around the airport, where he was arrested and put aboard a helicopter which took him to Sierra Leone. A contingent of Irish and international soldiers were posted to guard him. But, with the bitterness of the war still keenly felt, and with thousands of fighters still loyal to him, it soon became obvious Taylor could not stay in Africa. “His presence undermined the security of Liberia,” said Brig Gen Pakenham. So a new operation – called Lansdowne – was put in motion. This would remove him from the continent completely, but it was not without risks, says Pakenham. The compound where Taylor was held was surrounded by mountains, and there were fears of an attack from there – either to free Taylor, or to kill him – so the decision was taken to move the court to Holland. His soldiers cordoned off the airport, and with helicopter gunships and a raft of international troops on standby in case of a firefight, Brig Gen Pakenham personally escorted Taylor from the compound to the airport, to make sure he got out alive. He said: “I was well aware when I met him that he was indicted for 11 counts of heinous crimes against humanity. “I had read the indictment in great detail. I’d looked into Taylor’s background extensively, I read everything I could about him, I saw every film I had access to about him. “He was a former president of Liberia, and he was not found guilty at that stage, so I treated him with due respect. But in the back of my mind I knew damn well what I was dealing with. “When we spoke for those few minutes I offered him courtesy and respect as a former president, and a citizen, and a leader of a country. “When we got in the helicopter and strapped ourselves in, and I sat opposite looking at him. That’s when everything cascaded down on top of my shoulders in relation to the responsibility I had. “The mission would not be successful unless I get him to that aircraft and it takes off; and by way, the guy is facing 11 counts of the most horrendous, hideous crimes I’ve ever come across since let’s say the Second World War, or places like Cambodia or the Balkans. “Yet here I was sitting within two metres of this guy – knees touching, almost. Was Taylor fearful for his life? On the tarmac of Lungi airport, frightened and in cuffs, Taylor was a far cry from his usual image. “He’s a very charismatic person,” said Brig Gen Pakenham. “If you look at him on television, you’ll see he was a type of showman. He had a zeal for costume, and dramatic effect. “But in Freetown at the special court, and at Lungi airport, he was far from that. He was relieved to be getting out of Africa, because he knew in his heart and soul that his life was constantly in danger. The French airliner took left the tarmac at 9.39am, and a minute later Pakenham radioed the code words “out of Africa” to the base in Liberia – the mission was a success. “As soon as I got out in Monrovia I could see this was going to be something completely different,” he said. “When I landed there was a colossal reception in the airport. This wasn’t a normal military operation. The phones just didn’t stop. “There was a huge buzz in the HQ. I was drained, as you can imagine. I met quite a lot of people. Then I went home, went back to my pad and tried to relax. He would not comment on the kind of sentence he believes is appropriate for Taylor. But Brig Gen Pakenham, who retired in February, said he is proud of the role he played in today’s verdict. “Ireland, as a small nation, has made a significant contribution to the apprehension, arrest, transfer and ultimate trial of a former president who’s guilty of war crimes. “And we did it, really, unbeknownst to many people.